A water pipe broke in Campus Center Feb. 16 resulting in the building being evacuated for roughly 30 minutes. 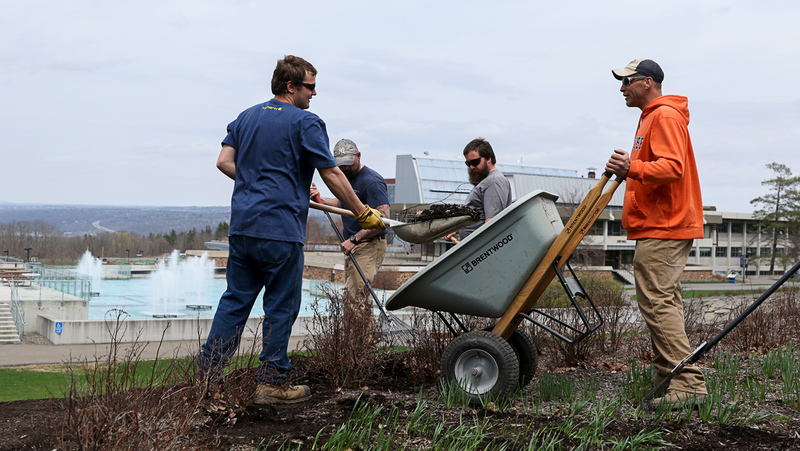 Buckets and trash cans were deployed across the Ithaca College campus recently to handle the rain and cold stressing the college’s infrastructure. Incidents were confirmed in Williams Hall, Roy H. Park Hall, the Ben Light Gymnasium and a side stairwell in the Textor hallway, and others were reported on social media. A water pipe broke Feb. 15 resulting in the evacuation of the Campus Center for approximately 30 minutes. Eric Nichols, director of facilities services, said the pipes broke because they were too cold. Timothy Carey, associate vice president and chief facilities officer, said it is common for cold weather coupled with torrential rain to cause leaks in areas with many large buildings like the college. “What happens is the water gets into the roof membranes and so forth, and as it expands and contracts, it creates small leaks,” Carey said. Carey said the one biggest maintenance-related initiative the college has is to develop the campus Master Plan, which includes a deferred maintenance program that will assess the campus’s infrastructure — roofs, boilers, windows and chillers are among items that would be assessed — to gauge when and how to address potential issues. Carey said the college is ahead of other colleges in this regard. According to the 2016–17 budget, there is a $188 million potential cost for deferred maintenance on the college’s campus, excluding Butterfield Stadium and all underground infrastructure.